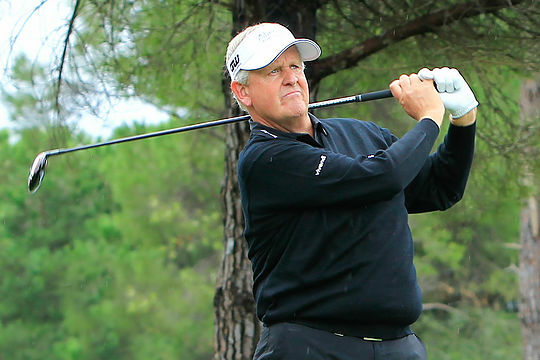 Scotland’s Colin Montgomerie now has three Senior Major titles to his credit after shooting a three under par 69 to successfully defend his Senior PGA Championship title in Indiana. Monty posted a four-round 8-under tally on the Pete Dye Course at French Lick Resort and four shots fewer than his rivals that ensures he’s won three of the past six Senior major championships. The 51-year-old Monty Scot won last year at Harbor Shores in Michigan, and also won the US Senior Open in July in Oklahoma and in a month’s time will defend his U.S. Open Senior title in Sacremento. Victory earned the former eight-time European No. 1 a cool $495,000. Esteban Toledo twice pulled within a shot on the front nine, but faded to post a 69 to finish second. Woody Austin was another shot back after a 69, and Brian Henninger and Scott Verplank tied for fourth at 2 under and with each carding 71s. Montgomerie and Bernhard Langer have won four of the past five senior majors, with Jeff Maggert’s win last week in Alabama in the Regions Tradition the lone exception. Playing in the final twosome with Montgomerie, Langer struggled in carding a 74 to finish sixth at even par. Peter Senior closed the tournament in equal 17th at 5-over with Peter Fowler another five shots back at T45.